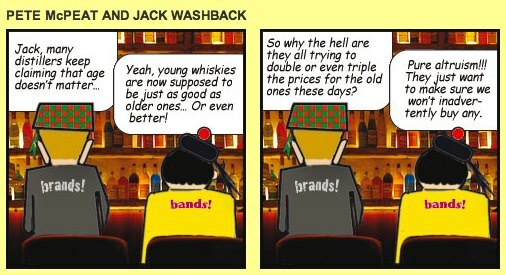 Ardbeg sample udgivet som promotion/marketing sample/gave til bloggere, pressen osv. Another impressive bottling from the folks at Dalmore, matured for almost four decades in bourbon casks before a final 18 month stint in 30 year old Gonzalez Byass Matusalem sherry casks. It's named for the latin word for 'Constellation' and is certainly rather shiny." duft: blomster - violer, måske. ÃƒÂ†blekage, lim, appelsin. smag: støvet rum og noget surt. Gamle frugter, der har ligget i blød i alkohol - og så træbitterhed. Fra i dag kan man så få Glenmorangie Millennium som er 12 år gammel og nedvandet til 40 %. Prisen er på 78,95 £ !!! Endnu engang et eksempek på at det hjælper der står Ardbeg på flasken. Jeg syntes at Uigeadail er noget bedre, ja nogengange meget bedre, end denne hotel aftapning. Så noget i samme standard som Braunstein? Det ser ud til der er en del danskere der har købt Braunstein første udgivelser i håb om at lave en mindre formue. Famous Grouse har da bevist at det er en udemærket whisky?? Det er lidt synd at sammenligne den med noget halvfærdigt noget. Medmindre det er lillesøsteren, Snow Grouse vi snakker om! "Spending More Wisely on Whisky"
Port Ellen - Are they taking the piss? The Glenglassaugh Distillery is pleased to announce the launch of an exclusive and unique range of single casks, each one of which has been finished in different wine casks from the world famous Crimean winery, Massandra. Massandra is the oldest winery in the Crimea, it has been producing fine wines for more than 110 years winning international acclaim for their exceptional quality. The winery was built in 1894 - 1897 near Yalta, Crimea and the subtropical air climate of the region and the protective shields of mountain chains create unique conditions for the production of high quality fortified and dessert wines. Glenglassaugh has exclusively purchased a small quantity of casks from Massandra which had previously been used for maturing the very best wines from this winery. Each cask has imparted it's own unique character and style and these now form the exclusive Glenglassaugh Massandra Connection Single Cask Series. Each cask has helped the single malt Scotch whisky to develop its own exclusive, distinctive character while still retaining all of the award winning qualities for which Glenglassaugh is rightly very highly regarded. This range is different, it is truly outstanding and each of the styles is unique. Man kan undre sig over hvorfor man vælger at lægge så gamle whiskies på vinfade. Det ser jo desværre ud til at det virker. Alle sætte jo priserne op nu. Det er som om whisky skal være en luksus vare, og det er sku en farlig vej at gå. Man må næsten håbe der er nogen der tager ved lære, men der er måske endnu en whisky boble på vej. Port Charlotte An Turas Mor Multi Vintage 46%, som med jævne mellemrum sælges hos Coop til 249,- (ca. 33 €) kan også købes hos hos andre danske forhandlere til 599. De kan dermed prale med at være verdens dyreste! Hvilken hjemmeside er det fra? Dalmore har sendt en "samlerflaske" på markedet. Octomore 5 Bruichladdich is the most highly peated whisky ever - now peated at 169ppm. 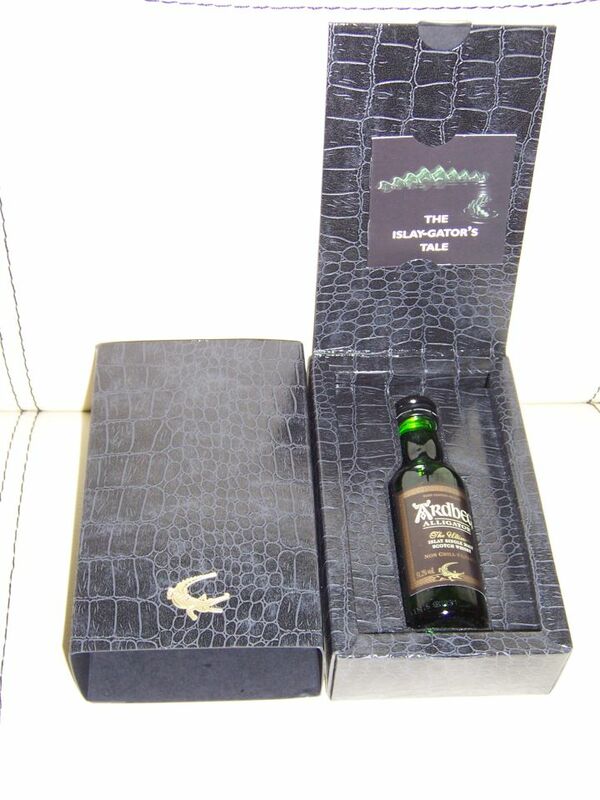 It is strictly a limited edition with only 18,000 bottles worldwide sold in allocation only. Octomore 5 is matured in classic oak casks with distinctive black packaging. "None of us saw it coming," Dinero says of the crash, "I mean, here I had invested most of my life savings into these whiskies, assuming I would be the first whisky billionaire once I flipped them all, but then it just all went to hell. Now I can't give the stuff away. I mean, I try to tell people, hey, this is a 50 year old Bowmore, and they're like 'dude, it's just booze.' The bottles are quite lovely though, I managed to sell a bunch of the empty ones on ebay. Apparently, they make a perfect vase for Dutch tulips." As many whisky lovers said at the time, the bright side about having a whisky collection, however worthless, is you can always drink it, but on that point, Dinero demurs, "Sure I drank some of it, but all those Dalmores? Who would want to drink all that stuff?"